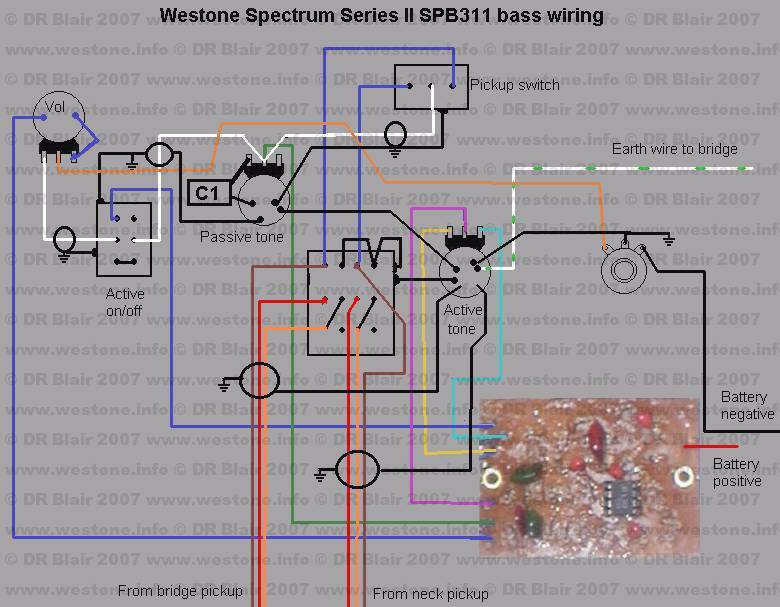 This is the wiring diagram for my SPB311. I presume it is a 1988 model as it has 24 frets and a beveled heel. The pickup selector switch is a standard SPDT (On/on/on) switch. The volume pot is 500k log, both the active and passive tone pots are 500k linear. The tone capacitor is 0.047 microfarad Mylar. The IC (GL358 dual operational amplifier) on the PCB is an obsolete part and may be hard or costly to obtain - if it needs replaced, an LM358 may be used instead. I have used different colours for all the other wires to make the diagram readable - on the guitar, they are all dark blue.